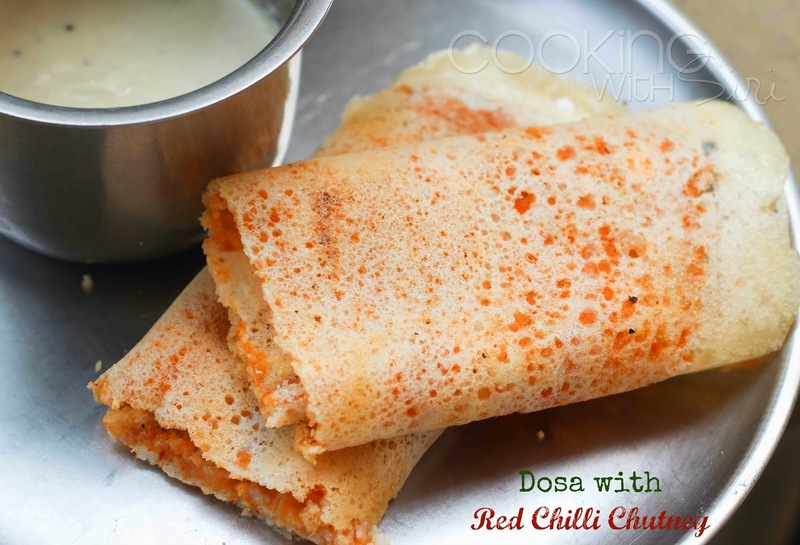 Learn how to make a dosa recipe topped with one of the simplest yet delicious red chilli chutney and lentil powder. Coming from a Telugu speaking family, I was saddened and surprised for the fact that I never tasted this type of dosa until I made especially for this A to Z Blogging series. If you are bored of the usual everyday sada dosas, you will be thrilled by these and make them at least once a week, like us. Red Chilli Chutney (Erra Karam) - Grind all the ingredients (chopped onions, red chilli powder, salt and garlic) into a smooth paste. Add few tbsp of water if desired. Pappula Podi (Daliya Powder) - Grind the roasted chickpeas with salt into a fine powder. Heat a tawa (preferably non stick). Pour a ladle full of dosa batter and spread into a thin circle. Top with few drops of oil on the sides. Spread red chilli chutney and then sprinkle some daliya powder. Once the base is crispy brown, fold into half and cook on each side for few seconds. Repeat the same process with the remaining batter as well. Serve as-is or with any chutney. Tip: To save time during those busy mornings, the red chilli chutney can be made ahead and stored in the refrigerator. The daliya powder can be ground and stored in an airtight container. wow..looks so tempting..can you also post a recipe of the chutney on the side. Thanks.